That was a little over a year ago, and since that time I have attended two shows by the Concord based Americana/Bluegrass phenomenons. Let me go ahead and eat crow. Part old time tent revival, part festival rock atmosphere, part family reunion with talented kin… all these things would be apt descriptions of the feelings of an Avett’s show, especially this homecoming on April 9 at Bojangle’s Coliseum in Charlotte, NC. Arriving on stage after a blistering set from Grace Potter and the Nocturnals, the Avett’s core trio gathered around a single condenser microphone like a radio show of old and serenaded the hometown audience with the John Denver classic, “Back Home Again.” The smiles on the faces of both Scott and Seth Avett were merely reflections of the joy that would be found on the faces of the sell out crowd for the next two hours. I could easily fill this space with a set list and review of the performances, but to me- the whole Avett thing, and what is causing them to grow at an exponential rate is more than their songwriting and abilities. It is the sense of community and belonging that they allow their audiences to experience. I say this not to take anything away from the songs, some of them like “Murder in the City” are simply beautiful and brilliant in their simplicity and truth.Others are also, simply- fun. 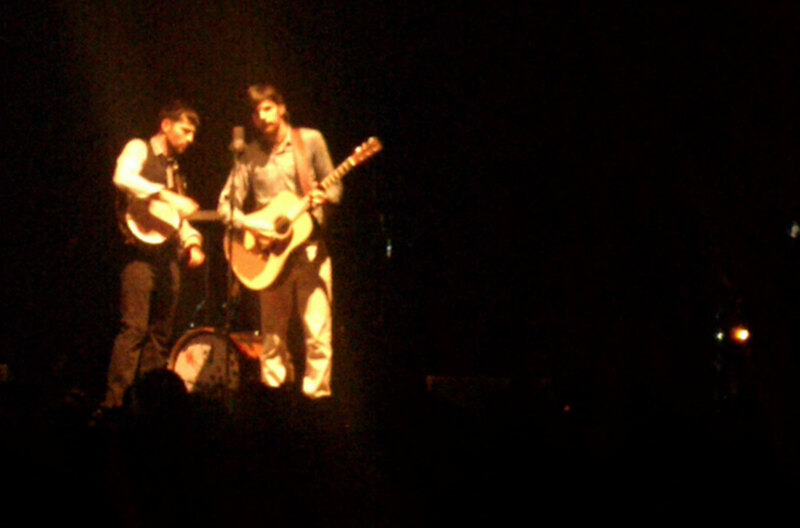 But the sense of being a part of something is the true experience of an Avett’s show. When I mention the family reunion above- I mean it. You truly get the feeling that those guys up there, are only on stage as a formality- they could just as easily be sitting around picnic tables filled with fried chicken and devilled eggs. Sure they have a bit more talent than Uncle Joe and his kids, but there is not a sense of separation between the audience and the crowd. The “thank yous” that are given out after each song are as sincere as the hug you receive from that second cousin you do not remember ever seeing before. The Avett’s have earned the position they are in, and have mastered the art of inclusion amongst their fans, yet they present none of the holier-than-thou attitudes found in most attainers of newfound fame. Rarely am I moved at a rock show, but when the majority of the audience raised their hands to the sky (much like those having a moment of spiritual release at a baptist tent revival) during the refrain of “I and Love and You,” I could easily imagine these guys having a altar call, and like their fellow hometown boy, Billy Graham, having 90% of those in attendance coming forward to profess their faith. Faith that rock may not be dead, it just might be led by a banjo and cello.